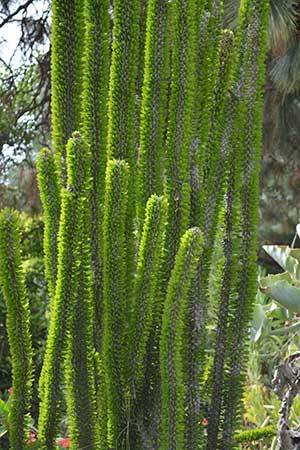 From Madagascar, Alluaudia procera is a drought tolerant succulent with a variable growth habit. One of the more unusual succulents, this is a relatively easy care plant and it grows well in cooler climates. Growing as a branched shrub, or in tall solitary spires it makes an interesting landscaping feature. In very dry conditions, Alluaudia procera will be deciduous, it maintains its spikes, and will reshoot with new foliage as soon as it receives adequate moisture. It can also be deciduous in winter in colder climates. As it drops its leaves, you are left with a pale grey trunk with sharp spines, still a strong feature in garden. In cultivation it is often evergreen and often grows as a group of tall green spires. Also known as the Madagascan Ocotillo, the plant is mostly grown in containers as a feature plant. It is suited to growing in the garden and looks impressive against a white wall where the tall green spites create a strong architectural impact. Best grown in a very well drained soil in full sun. It is also suited to growing indoors as long as good light is provided. As soon as the plant decides to go into deciduous mode, watering should be stopped for a while. This dormancy period is important to its growth habit. Easy by cuttings, and also possible from seed.